When Julio first came to Arlington Free Clinic (AFC) outside Washington, D.C., he was on crutches. His foot had swelled from diabetes-related complications from an injury suffered from his work as a day laborer. A recent immigrant, he’s determined to escape the fate of his father, who died of diabetes-related complications in Honduras. AFC is one of more than 1,200 free and charitable clinics around the country that serve people who are uninsured, underinsured, or have limited access to care. These clinics operate with little or no state or federal funding and utilize a volunteer/staff model to provide a wide range of medical, dental, pharmacy, vision and behavioral health services to the economically disadvantaged. In February 2018, the CVS Health Foundation announced $1 million in new grants to 49 free and charitable clinics across the country, including $20,000 to AFC. The latest grants bring the Foundation’s total contribution to free and charitable clinics to more than $4.5 million since 2015, supporting increased access to quality care as well as chronic disease management and prevention. Over the last two years, free and charitable clinics have experienced a 40-50% increase in patient demand, but donations have declined by 20%, according to the National Association of Free & Charitable Clinics. AFC has to use a monthly lottery to provide patient appointments. There is such a huge demand that almost half of the patients can’t get an appointment that month. Patients who come a second and third time get multiple entries into the lottery to ensure they can see a clinician. AFC patients can access dozens of medical specialties under one roof, thanks to a network of more than 500 volunteers. “There’s something very gratifying about taking care of people who need your care, but couldn’t afford it otherwise,” says Dr. Ian Shenk, a gastroenterologist who volunteers for AFC. Dr. Shenk, now retired, long provided charitable care in his practice. But he says the clinic’s resources allow him to serve patients in a more comprehensive way. It’s long been documented that poor and marginalized people face greater obstacles to health and wellbeing. At AFC, a CVS Health Foundation grant funds Community Bridge, a program that addresses non-medical factors that influence health. Community Bridge links clinic patients with safety net service providers in areas including food and rent assistance, parenting programs, immigration rights and support for victims of domestic violence. In addition, patients referred through Community Bridge partners can get a clinic appointment without having to enter the lottery. 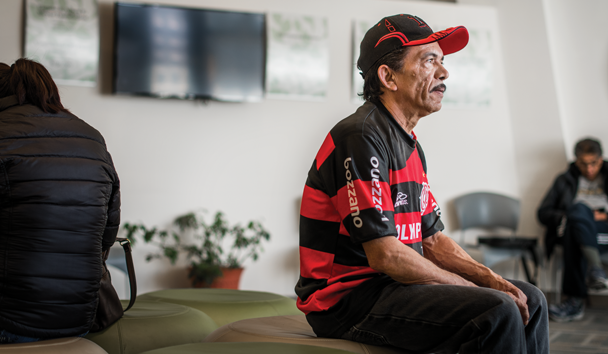 Day laborers like Julio are among the hardest people for providers to reach. Julio learned about AFC through the Shirlington Employment and Education Center (SEEC), a Community Bridge partner that facilitates employment, vocational support and educational support for workers. Clinic workers conduct outreach at SEEC to bring in day laborers as patients. To accommodate day laborers, the clinic is open in the evenings. “I tell the people here you don’t need to deny yourself health care just because you can’t afford it,” says Andres Tobar, executive director of SEEC. SEEC and the clinic have developed a strong relationship. Volunteer physical therapists from the clinic travel to SEEC to train the laborers on workplace injury prevention. For its part, the clinic hosts free courses from SEEC aimed at the Latina women who clean homes or care for the children or elderly in Arlington. One such course focuses on housekeeping using healthier, less-expensive natural products; the other, on the mechanics of starting a business such as marketing, budgeting and accounting.